Alamos reflects Mexico's varied past. Spanish colonial traders brought goods from Asia to Acapulco. The wealthy looked to Europe. Alamos ladies ordered their gowns from Paris. In the pueblos, the Mayo and Yaqui Indians blended their traditional ceremonies with Christianity. The galleries and shops reflect this international, yet very local mix of art, antiques and craft. The larger shops list prices in dollars, the smaller ones in pesos; ask if you aren't sure. Business hours vary. Look for these numbers (1) to find the locations on our Alamos sketch map. 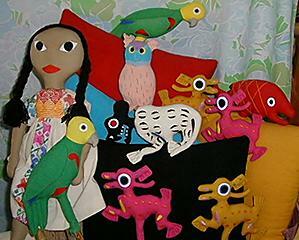 Figure 1: Pillows and dolls designed by Elizabeth Nuzum and sewn by Carmen Rosas, ask directions for her home-based business. The hotels, shops and street vendors on both plazas, including the Museo and on Calle Obregon (1, 2 and 5) offer a changing selection of Mexican and international arts and crafts, regional books, music, postcards. El Nicho (5) at Juarez 15 has a mix of Mexican crafts, antiques, estate odds and ends, jewelry, beaded gowns, books. Art and craft by local and expatriate artists is for sale during festivals, at some of the hotels and from their home studios. There are designers who do custom orders. Ask at the galleries, coffee shops or your hotel if you are interested in learning more. Wood carvings are made for sale. Ironwood carving was started by the Seri Indians, but the figures sold in the booths along the plaza are produced in large quantities by Mexican carvers. The Tarahumara carve figurines from bark. Other carvers produce occasional pieces. Functional baskets and plaited matting are brought in by the Mayo to sell on the plazas. The Seri and Tarahumara make fine baskets which may be available in some of the craft shops. Hand-spun and hand-loomed rugs or blankets, the deep blue dye is indigo, the browns and creams are natural wool. A very few of these are made by Mayo and Tarahumara weavers. The Tarahumara also weave belts. Pottery is usually large water jars (ollas) or storage jars made by Tarahumaras or local Indian and Mexican potters. Watch for their children selling pottery on the streets. The local novelty is Mexican jumping beans. A tiny worm in the bean makes it jump when warmed in your hand. Another local product is horsehair hat bands, key rings and bridles. Figure 3: Delightful embroidery by Martha de Bustillo. Alamos artisans sell embroidery and other crafts under the portal outside the hotels on Calle Obregõn and in some shops. It's fun looking into small shops of all sorts, at the souvenir booths on the church plaza and at the Sunday Tianguis Market (6) just to see what turns up. I have found good handblown glass, fancy hair ribbon rosettes for little girls and wonderfully gaudy costume jewelry. Some of the horsehair hat bands, key rings and belts are made locally. Copper comes from the village of Santa Clara del Cobre near Pãtzcuaro. Tianguis usually has some miniature pottery and wood carvings made in the south. One table has a few silver milagros. The local bent-wood furniture may have borers if the wood wasn't cut in the right season. At Christmas, look for shimmering cut-mylar ornaments, handmade wood ornaments and papiermâché figurines. The town market (3) has seasonal piñatas. At Easter, festival booths sell cascarones, colorful egg and paper cones filled with confetti to represent flowers. When someone breaks one over your head, you are showered with God's grace.